I like the idea, but still the solution you propose leaves me a little confused, especially when we decide to escale up the number of entities, wouldn’t that be very very high cost ??? You’re absolutely right, it is expensive. But with a large number of objects you hopefully have the statistical scale to get away with the inconsistencies of traditional steering behaviours, so my complaints go away. Also: thanks for taking the time to read and comment! You’re my first ever commenter! All depends on your application, of course. I used my proposed fix in a racing game where speeds were so high collisions would have been catastrophic for the cars involved. Another racing game I know of used a simple finite state machine, but for their genre it was absolutely acceptable. But my proposed fix is about more than just collision avoidance – the behaviours are very simple and easy to balance, yet the emergent properties are more complex than standard steering behaviours. I’ll explain more in my next post. If you’re on reddit please consider submitting the next post to http://www.reddit.com/r/gameai – I’m interested in reading about your approach and I expect others will be as well. Thanks – I will do. Thanks Andy. Having never had to write any AI code for the games I have worked on I was only really aware of the existence of steering behaviours as a concept. The article does a very good job of explaining the principles of the technique. This might be showing off but I must say I realised fairly quickly where the approach would run in to problems and that there would need to be certain restrictions lifted for it to actually work in practice. I’m certainly looking forward to your next blog post to see how you intend to address the problems. I’m anxiously awaiting your followup article. The view steering behaviors as a low-level command. Perhaps as low level as supplying the force vector for the physics integrator. Some more intelligent code selects the currently active steering behavior for the agent. Something like a behavior tree or (I presume) these context maps. This code need not update at the same rate as the physics or the graphics. Heck, _I_ certainly don’t update that fast. You could certainly move the target selector into a higher system, but that really only moves the problem. That higher system still needs to choose targets that are reachable, so the obstacle avoidance again bleeds into the target selector, even if you run it at a lower framerate. If you have multiple behaviours your higher-level system quickly becomes a megaclass. Well, the obstacle avoidance vector you are using in the last example is not exactly right… That one is the ‘Flee’ vector (run away from the obstacle). An avoidance vector in that case could be perpendicular to the vector towards the obstacle (choosing the perpendicular vector that leads closer to the target). That way the obstacle would be avoided. Andrew, I just saw your posts today, via a student in a Game AI class where I recently gave a talk on steering behaviors. While I liked the second post in this series, this one felt like a strawman argument. Steering behaviors have been in wide use for about 27 years, which suggests that the problems you describe are not fundamental, and may in fact be related to your own implementation. I am glad you were led to find a useful enhancement, as described in part two, but does not support your argument that simple steering behaviors are weak or ineffective. For example, as PlayMedusa points out above, your third figure is simply wrong. The obstacle avoidance steering behavior returns a vector that is perpendicular to the heading of the agent. It is described that way in the 1999 GDC paper, and the obstacle avoidance behaviors used in Breaking the Ice in 1987 worked that way. (As does the reference implementation in OpenSteer.) So you certainly would not get a zero length result. The path would look a lot like the right hand example in your first figure. Depending on your cost and reward metrics, choosing the much closer target is probably the preferred behavior. You say “the collision avoidance behaviour has no direct control over entity movement” but in fact it could have if you had not begun by brushing off steering combination techniques beyond simple averaging. A very common approach is to use steering behaviors in the context of a simple decision tree. Start by calculating obstacle avoidance. If the result is nonzero, then return that as the combined steering force. If it was zero, meaning no potential collisions within your prediction horizon, then you move on to compute the non-obstacle-avoidance portion of your steering force (goal seeking for example). Between this hard-edged conditional steering and simple averaging are a wide range of more subtle and agile ways to combine simple steering behaviors. About that “annoyingly pluralised” name, as you said “The system contains many behaviours…” The 1999 paper used the plural in the title for exactly this reason, that the technique involves a toolkit of simple components meant to be combined together to create more interesting and complex results. It’s an honour to have you comment, Craig. Thank you for taking the time. I’ve addressed both your comments together. First of all understand that despite my hyperbole, I think steering behaviours are a wonderfully elegant and practical solution to many problems, and I am thankful you created them. I never wanted to suggest they’re weak or ineffective in anything but very specific circumstances. The distinction I stumbled upon in the second post was that, when the entities are designed not to be observed as a flock, but as individuals, inconsistencies in steering can become visible. I’ll return to this point later. You’re correct that the obstacle avoidance steering behaviour is presented incorrectly, but I think it’s a simplification, rather than a straw man. The point here isn’t exactly how obstacle avoidance works, just that it’s possible for two behaviours to reach equilibrium. I could have presented obstacle avoidance correctly, but I decided to make the blog post as accessible as I could to people unfamiliar with steering behaviours, and I didn’t think it changed the argument substantially. You’re also right that a priority or decision tree control system would have avoided a equilibrium situation, but this would trade one inconsistency for another. 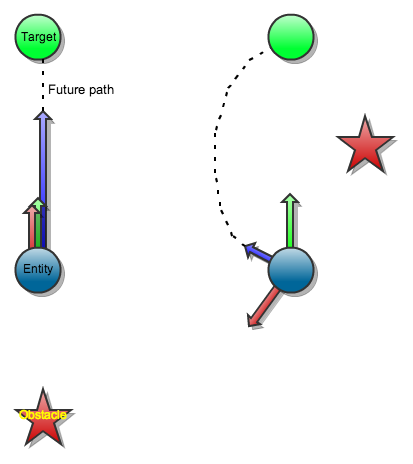 The desirable result would be for the entity to move towards the target that was not blocked by an obstacle. With a decision tree, the entity moves away from the obstacle but no longer makes *any* decisions about moving towards targets. In the last image of the post these results are actually the same, but it’s trivial to construct a situation where they’re not, and the entity acts inconsistently. Returning to the blog posts’s example, if we could merge the furthest-target vector and the obstacle vector somehow, we’d get a good solution. But the only way to do that is to disable the decision tree again and add collision knowledge inside the target selection behaviour. At best this is redundant coupling, at worst it’s some very hacky code. The obstacle avoidance behaviour should be the one to care about obstacles, not the target selection behaviour. That is why I brushed off combination techniques. They don’t change my fundamental argument – that steering behaviours return solutions, without the context required to merge them with integrity. I actually think part of the beauty of steering behaviours stems from the fact that their elegance and weakness are two sides of the same coin. You make a good point about performance comparisons. In the project I used context steering in, they ended up being substantially more expensive than the system they replaced for exactly the reason you make. However this might not be a universal truth – calculating many vectors from each behaviour is more expensive than just one, but because of the way the behaviours combine you could drastically reduce the number of necessary path-finds or raycasts. YMMV. Either way I shouldn’t have claimed performance advantages for context steering. And for exactly the reason you state, I am yet to think of a practical way to make context steering work in three dimensions. That’s been made clear in all the talks I’ve given on this, but I should have done the same in the blog posts. I think “target selection” is a separate problem and not part of generic steering behaviors. The basic Seek steering behavior is applicable only after a single goal has been identified. I would put target selection under the control of something like that decision tree for a given application-specific agent in a given scenario. It might be asking questions like: are there any interesting goals near enough to target?, if more than one, which is best?, etc. For fast-moving agents, the key question is often: how close is a target to my predicted future path? Simplifying examples for pedagogical reasons is fine, but those same readers unfamiliar with steering behaviors might then confuse them with phenomena like electrostatic attraction and repulsion of inert bodies. 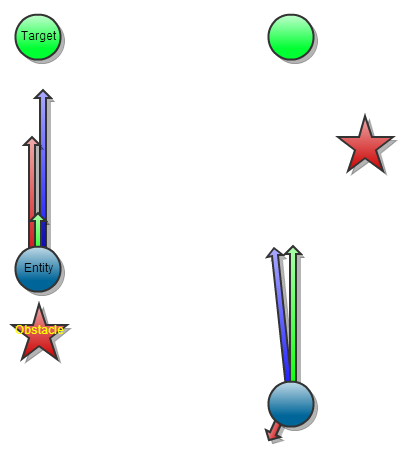 A concise description of how steering behaviors differ is that they compute a corrective feedback to the “steering error” — the difference between an agent’s current velocity and its desired velocity. So electrostatic forces are radial “central forces” while steering behaviors usually are not. that’s why the steering behaviors are multiplied by weights.